How many homes does a cat need? A bold black cat sets her sights on moving into the Z house, where Mom Z and her son, Noah live. Mysteries unfold as the Z family tries to get to the bottom of the young cat’s puzzling behavior. Noah has his heart set on getting a dog, despite Mom Z’s list of rules. Most important, the dog has to get along with the cats living at the Z house — grouchy Miss Kitty and anxious Angela. The search begins in earnest when they visit the animal shelter and find a dog who thinks she is a cat. Is this the one? Summer has come to the Z House. Mom, Noah, Pepper the dog, Miss Kitty, anxious Angela, and the new kitten are preparing for Grandma’s visit. But Noah is worried. He’s going to miss seeing his friends at school — and what if he doesn’t like going to the summer camps Mom Z has signed him up for. Come along to see how it all turns out! All Noah wants for his birthday is a fish pond, and he wants to build it himself. He discovers there’s a lot to learn: how much dirt to dig up, how much water it takes to fill up the pond, and how many fish can healthily swim in the pond. 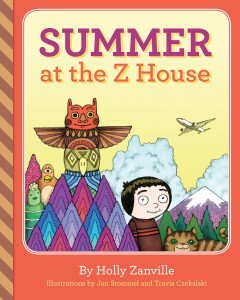 But when the fish start growing too big for the pond, what will the Z family do? Mom Z hatches a surprise plan to save the fish.